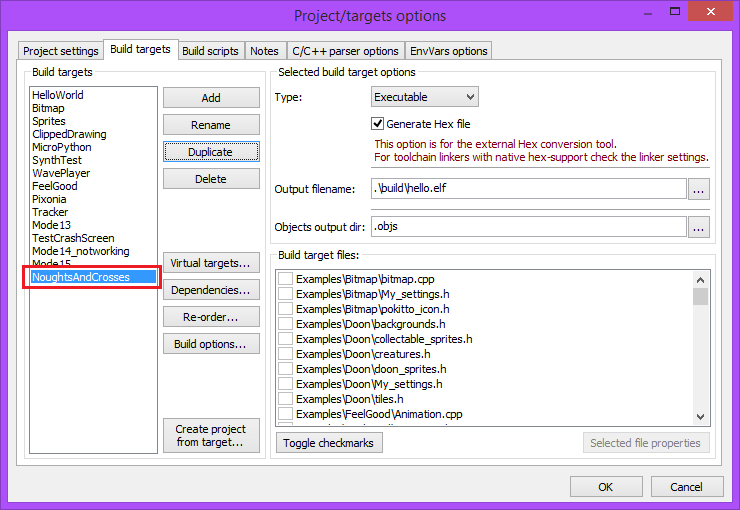 I’m going to be showing you how to add a new build target on EmBitz via the PokittoLib. For demonstration purposes I will be using my noughts and crosses game because it is relatively small. Firstly, make sure you have a copy of the PokittoLib downloaded and set up. Secondly, make sure you have a copy of my Noughts And Crosses game. Go to the Build targets tab. You will see a list of build targets and various options. Rather than setting up a new build target from scratch, it is easiest to duplicate the HelloWorld target. 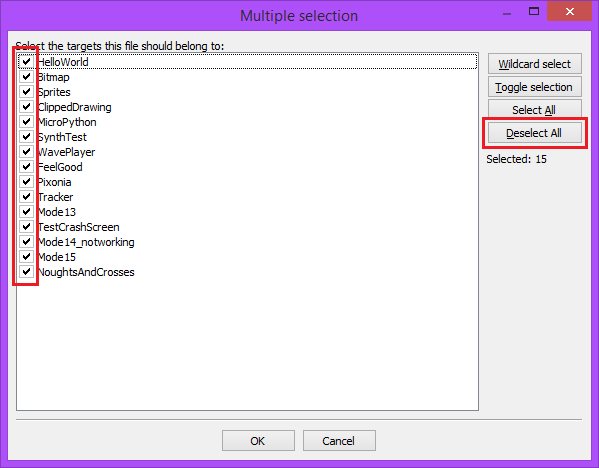 Select the HelloWorld target and click Duplicate. You will be prompted to chose a name for the new target. In this case we’ll be using NoughtsAndCrosses. The new target should then be appended to the target list. The target will be created with the same settings as the HelloWorld target. To avoid conflicts, those settings will have to be changed. Change the Output filename: from .\build\hello.elf to .\build\NoughtsAndCrosses.elf, and then make sure that Examples\HelloWorld\main.cpp and Examples\HelloWorld\My_settings.h are unticked in the Build target files: area. If you forget to untick those files, you will get errors when trying to compile because main will be defined twice, once in Examples\NoughtsAndCrosses\main.cpp and again in Examples\HelloWorld\main.cpp. 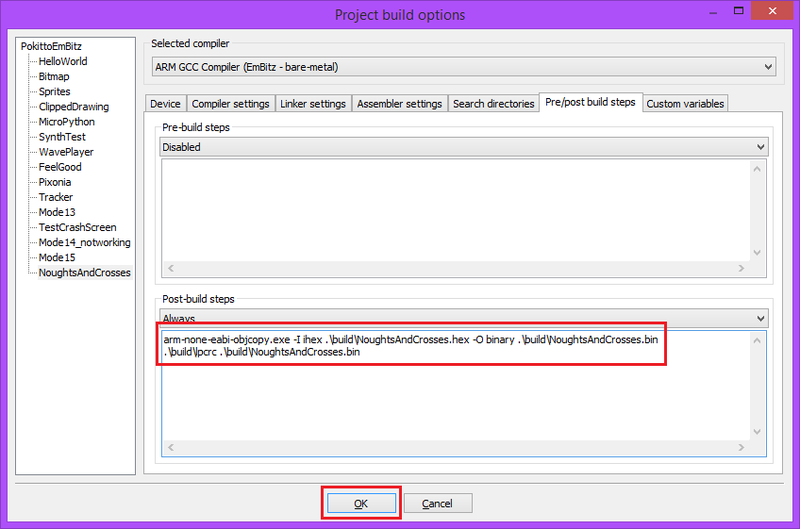 Open Project > Build options... (or alternatively press Alt+F7). Select the NoughtsAndCrosses build target. Then select the Search directories tab. You will see that the directory is set to Examples\HelloWorld. 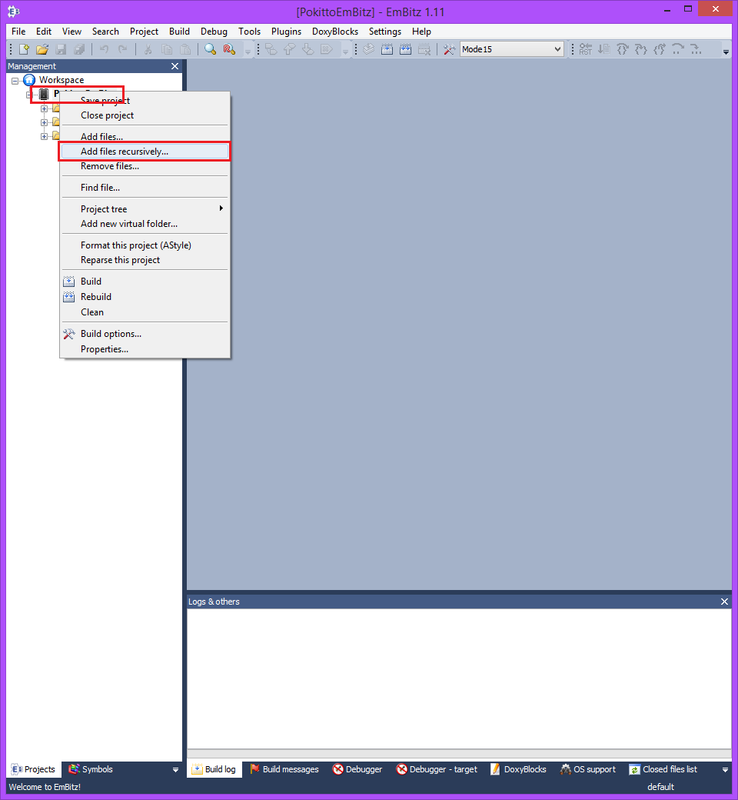 Select the Examples\HelloWorld entry and click Edit. You will be prompted to edit the directory. 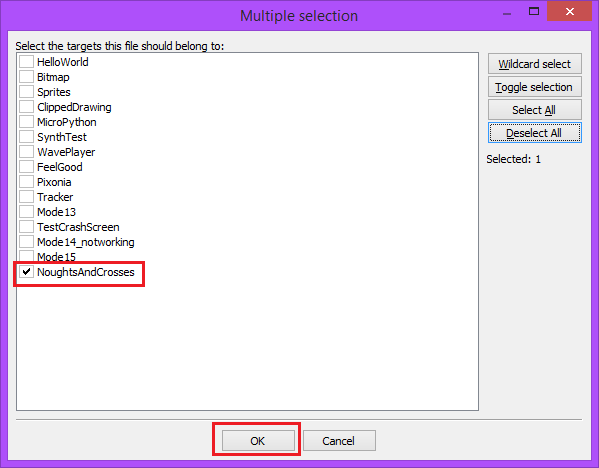 You can simply manually rename it to Examples\NoughtsAndCrosses. When the directory is correct, press the Ok button. Double check that the directory is correct before moving on. Now select the Pre/post build steps tab. There shouldn’t be any Pre-build steps, but the Post-build steps should have two lines. 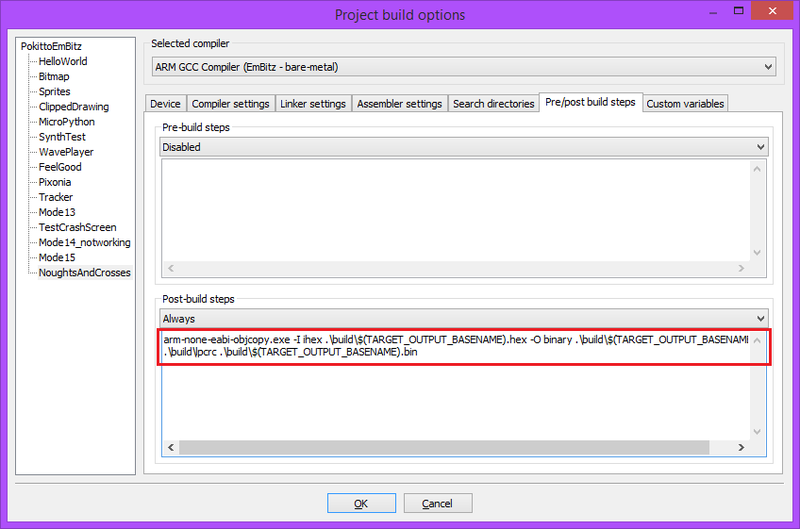 The first is the command for doing an object copy to turn the generated machine code into a .bin file. The second is the command for creating the cyclic redundancy check (CRC) checksum that certain ARM units need to verify the integrity of the code. If you look carefully, you’ll notice that the post-build commands mention ‘hello’ three times. One case of.\build\hello.hex and two cases of .\build\hello.bin. The hello parts of these names matches up with the hello.elf mentioned in the project properties. 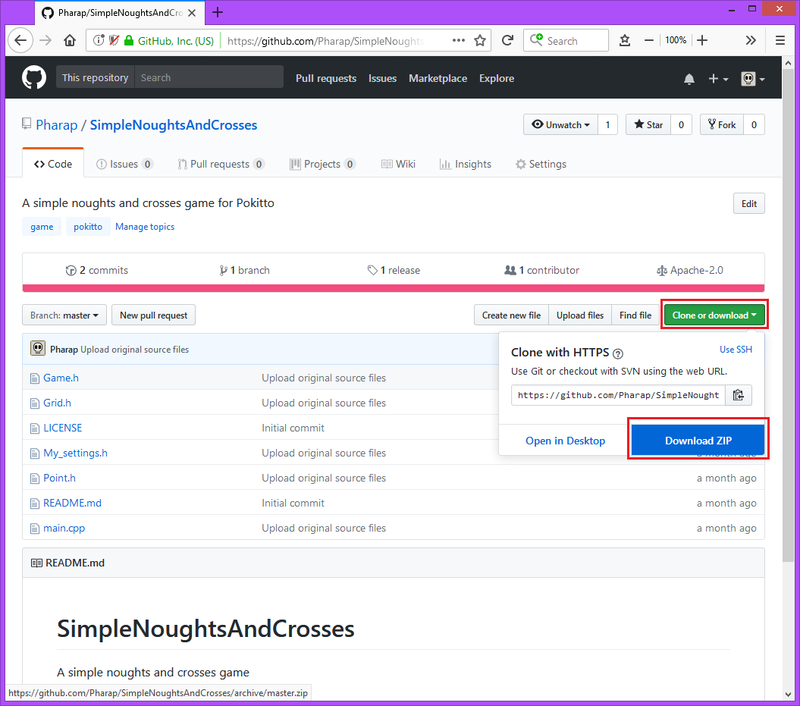 these need to be changed to .\build\NoughtsAndCrosses.hex and .\build\NoughtsAndCrosses.bin. However, there is in fact a way to make the .hex and .bin files match the .elf file exactly, so that if you change the .elf name, you don’t need to edit the post-build step again. The $(TARGET_OUTPUT_BASENAME) part is what’s known as a (expandable) compiler macro, or an (expandable) compiler variable. It essentially acts as a stand in for a project-specific or target-specific value, similarly to a C++ macro, hence why the build event updates automatically to reflect the specified .elf name. Additionally, if you want to make the output files match the name of the target, you can change .\build\NoughtsAndCrosses.elf to .\build\$(TARGET_NAME).elf. 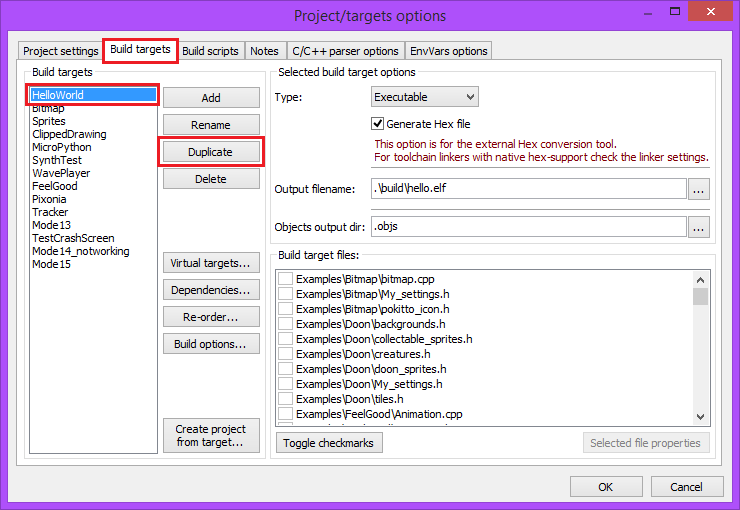 Combining this with the aforementioned $(TARGET_OUTPUT_BASENAME) in the build event means you can then use that target as a base for duplication for creating new build targets and then you will only have to change the target name and the target includes, you won’t have to touch the .elf file or build events. Next you need to put all the source files into a subdirectory in Examples. 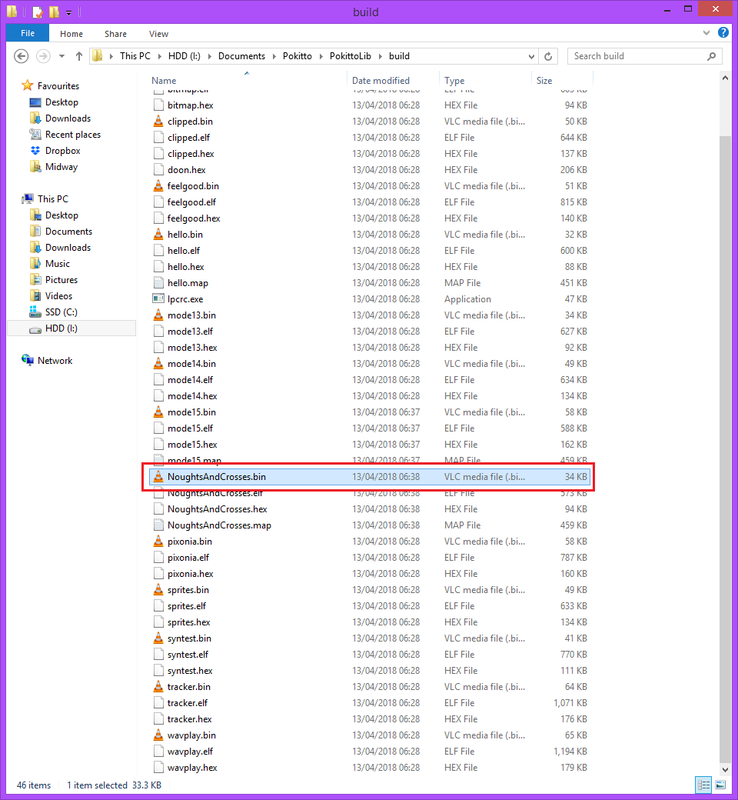 If you didn’t get the source files earlier, get them now by downloading them from Github by clicking Clone or download followed by Download ZIP. Following that, you need to make the subdirectory that you’re going to put your files in. That subdirectory should have the same name that you supplied as the search directory in step 3. In this case that’s PokittoLib\Examples\NoughtsAndCrosses. 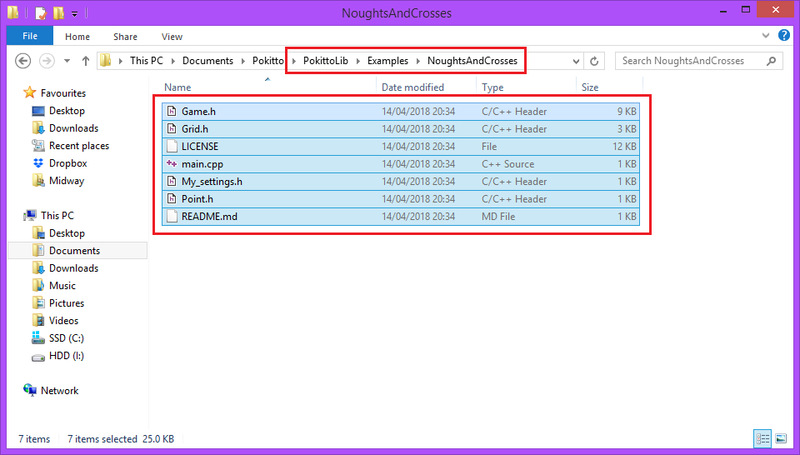 So navigate to PokittoLib\Examples and then create the folder NoughtsAndCrosses. 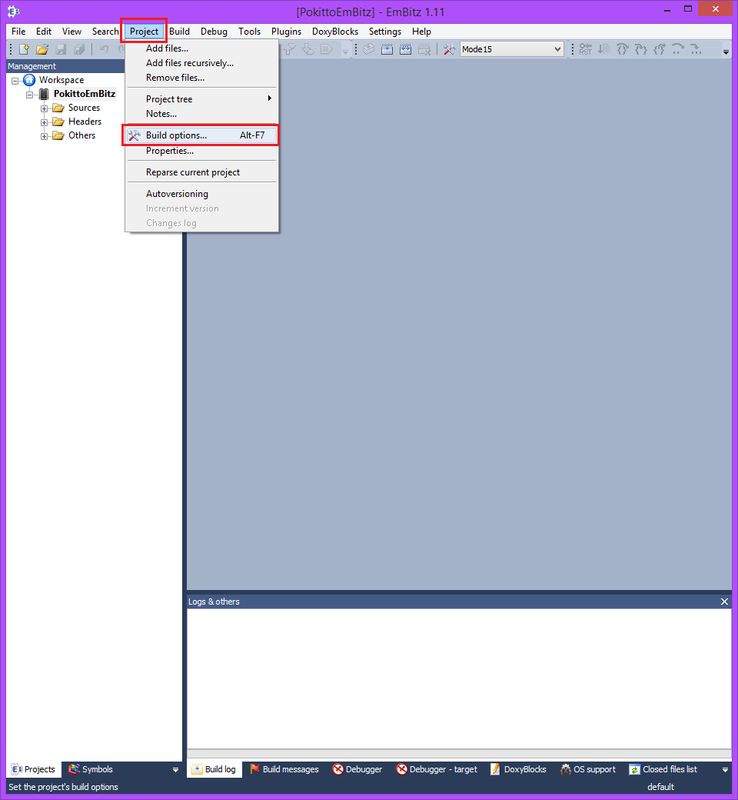 Then you need to open the zip file you downloaded earlier and copy the source files across to the newly created folder. You don’t have to include non-source if you don’t want to, but it’s good practice to keep the licence around. 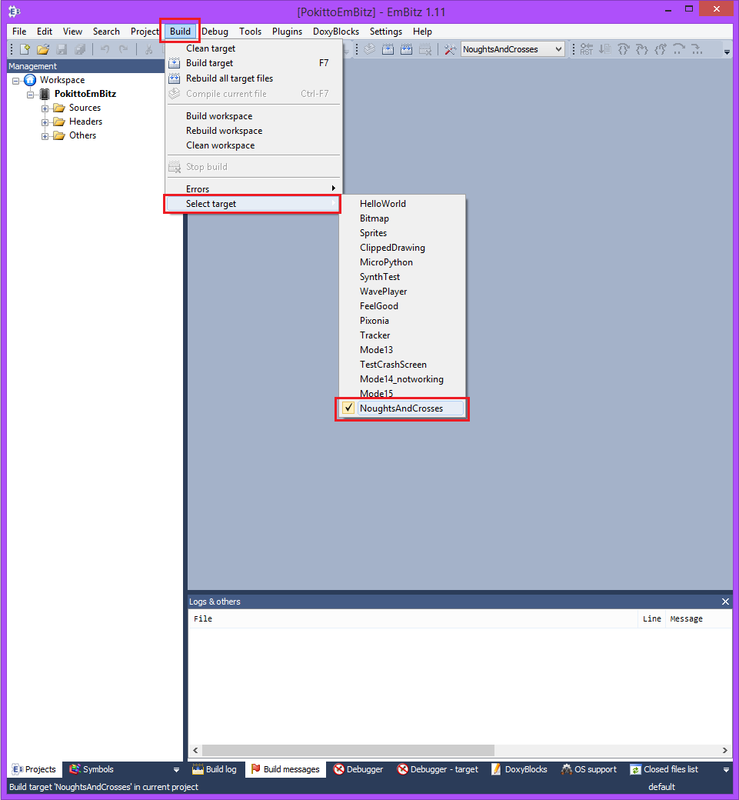 When the directory navigator appears, select the directory that you have put the source files in. A box will pop up showing all the files in that directory. Only ticked files will be included in the project. which in most cases are the only files that you want to include in the project. If you are happy with all the files that have been ticked, press OK.
Next another box will appear, asking which build target you want to associate the files with. By default all build targets are selected. 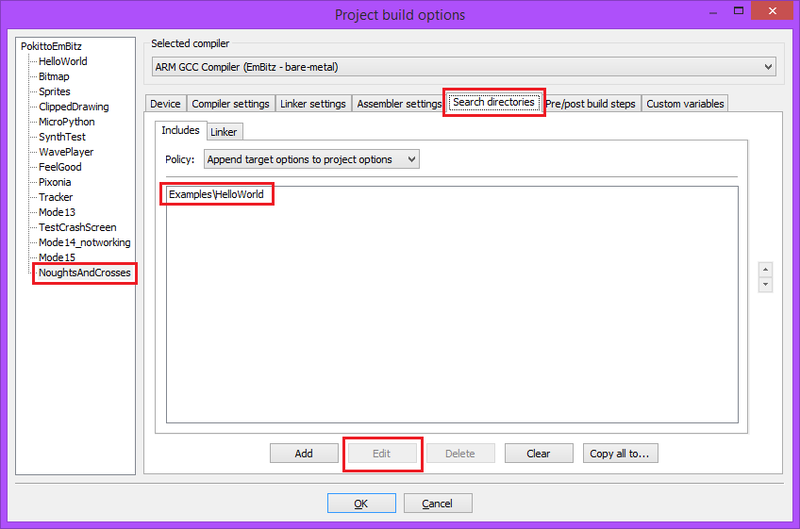 Choose Deselect All and then select the build target you recently created. In this case that’s NoughtsAndCrosses. Now to confirm that everything works. First, make sure your new build target is the selected build target. Then build the target by going to Build > Build target or pressing F7. You may be prompted with a box asking if you’d like to save changes before you start building. Choose Yes. Then check the PokittoLib\build directory and you should see the appropriate files have been generated, including a NoughtsAndCrosses.bin. 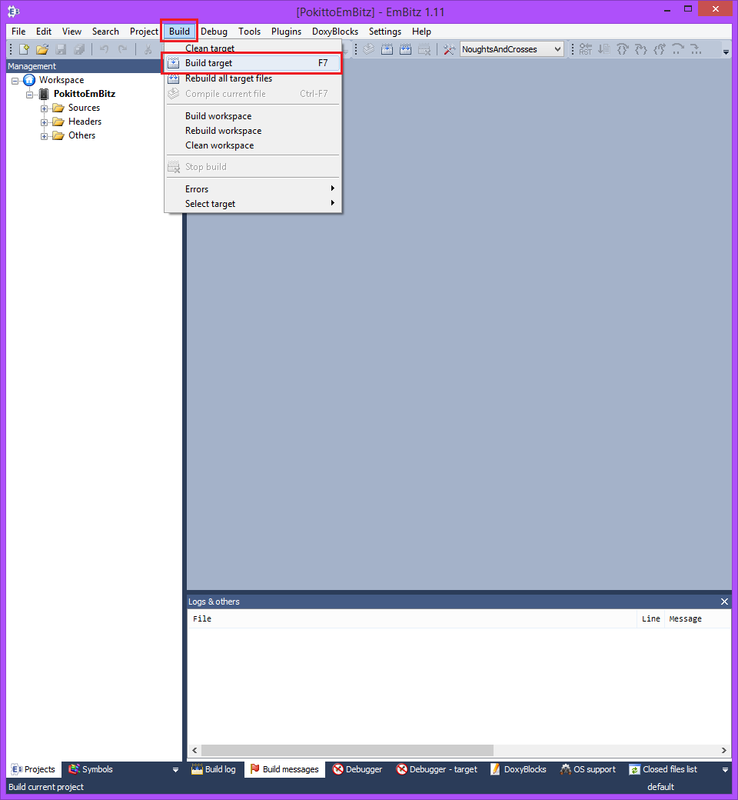 Simply upload the .bin file as you would any other .bin file. @Pharap, i had a little struggle placing the game files. Was it your intension to place them inside the example folder ? 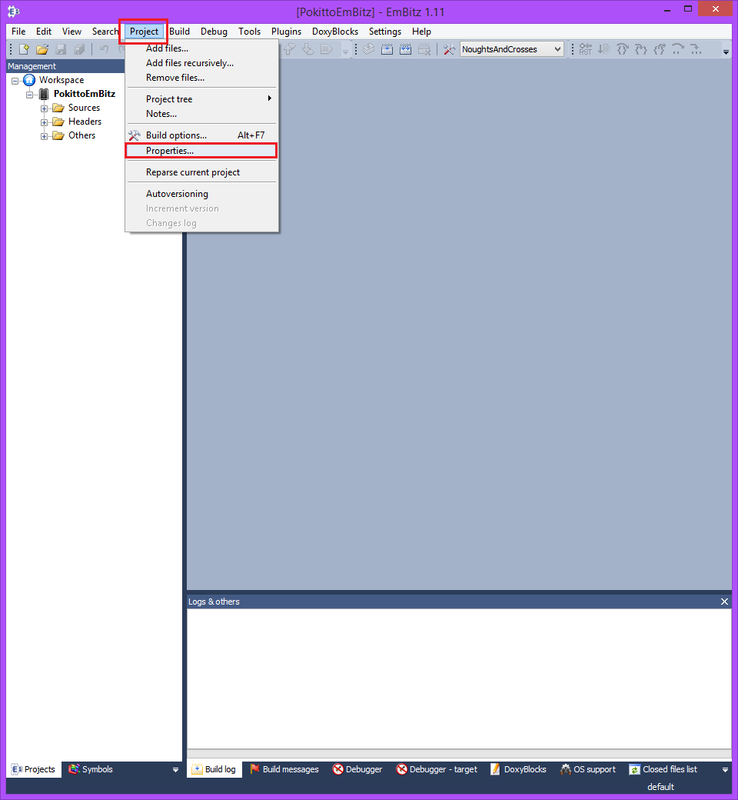 Was it your intension to place them inside the example folder ? Truthfully I haven’t quite got round to figuring out if it’s possible to place them in other folders. I decided to play it safe and place them in the ‘Examples’ folder for now. I know it is possible to put them elsewhere, but it’s a question of whether any extra settings would need changing. At minimum it would probably be another step in the tutorial. When you do, summon me on the other thread, since that’s a separate issue to adding build targets. That is not mentioned in the tutorial, would really help to add it. And place it inside the examples folder, this is found inside the PokittoLib. (That subdirectory should have the same name that you supplied as the search directory in step 3). In this case that’s Examples\NoughtsAndCrosses. 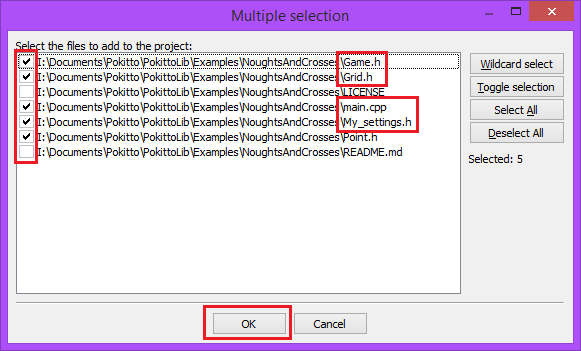 Should I change Examples\NoughtsAndCrosses to PokittoLib\Examples\NoughtsAndCrosses? Is there something else I could do to make it clearer? I read it like i had to add those files into embitz using the “add recursivly function”. 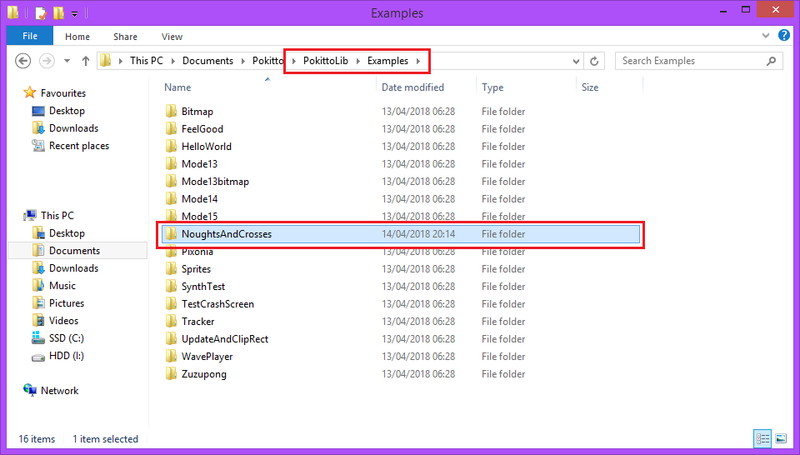 To me as i was reading it, it was not clear i had to get the files out of the download folder and place them into the pokittolib under examples. In this case that’s Examples\NoughtsAndCrosses. Simply copy and paste them into the folder. Hope i am being clear here, if not please say. 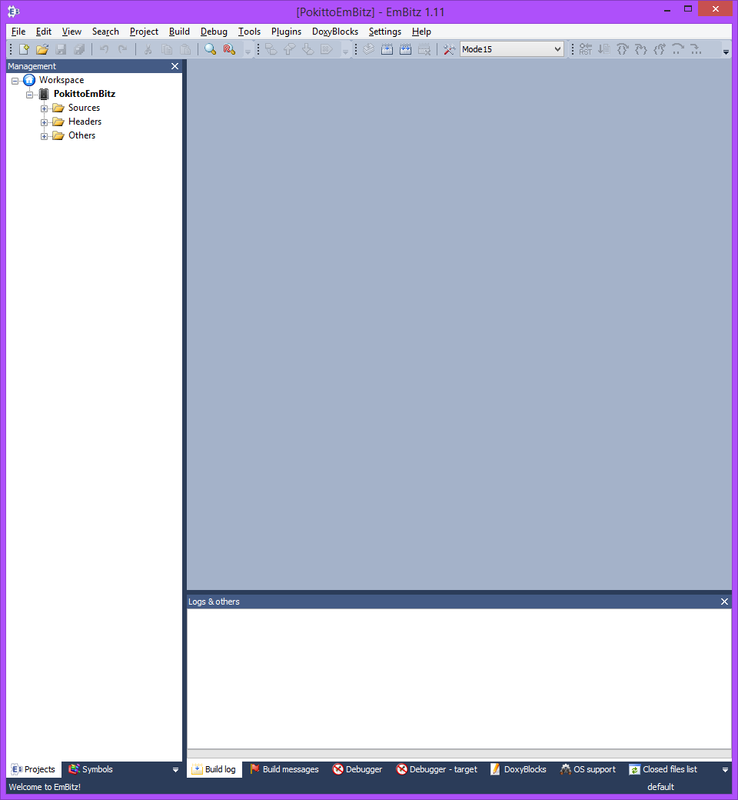 Hrm, I’ll look into adding another step that shows the folder creation and the moving of the files. I’ll probably add it tomorrow rather than today though. I’ve made some edits to step 4. Do you think it’s clear enough now? I’ve recently discovered a way to make the post-build event dependent on the name of the .elf file so it can be changed in Project > Properties... and then the buid event will almost automatically update. 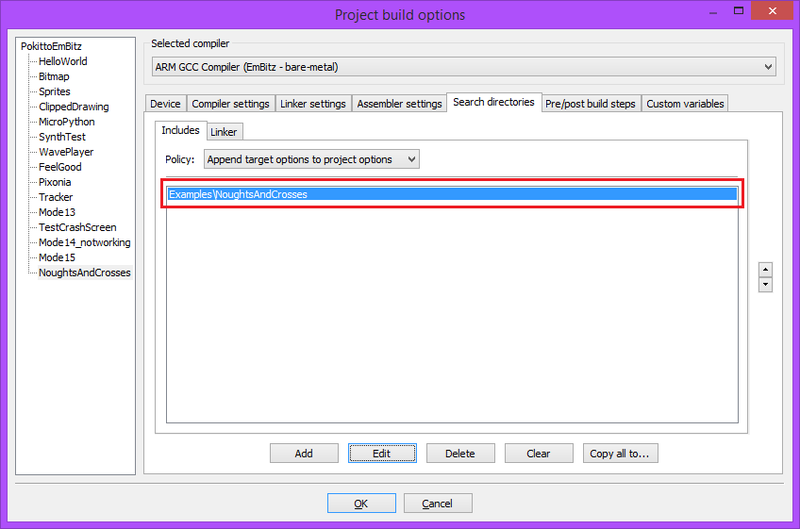 ‘Almost’ because it seems the project build options don’t automatically update when the project/target options are changed, so you have to open the build options window and ‘OK’ it for the changes to apply. Where HelloWorld is the name of the build target (e.g. NoughtsAndCrosses or Pixonia). 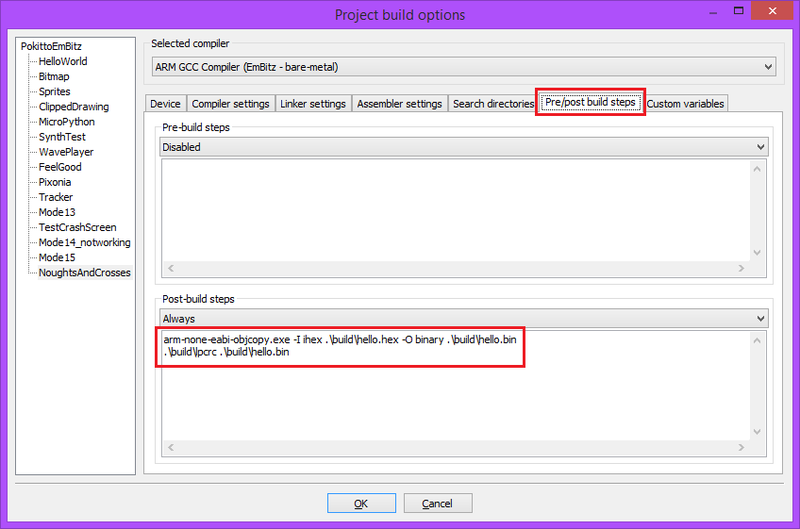 To go a step further, you can then replace the build target’s output filename with build\$(TARGET_NAME).elf and the output files will take on the name of the build target. For example, the Sprites build target would generate Sprites.elf and thus Sprites.bin instead of clipped.elf and clipped.bin as it currently is. I won’t update the tutorial yet in case I find a better way of doing this or figure out why the update doesn’t automatically probagate, but this is really useful. 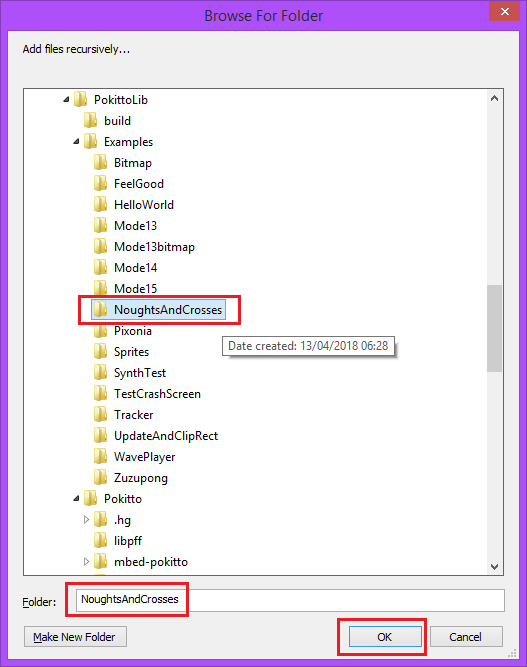 If we changed all the examples to use this technique (or at least HelloWorld), then the build target could be copied without having to change the post-build event or the output filename, thus allowing the user to skip a chunk of this tutorial. It seems that while $(HelloWorld_OUTPUT_BASENAME) is lagged, $(TARGET_OUTPUT_BASENAME) is not. I have added the new information. 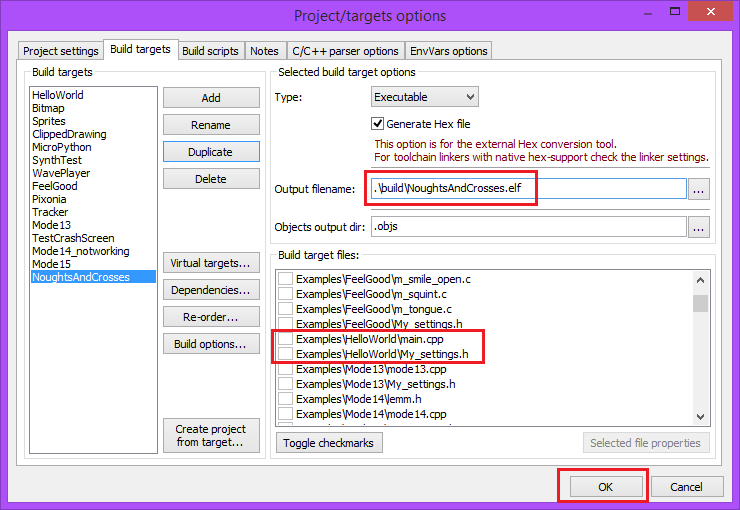 As of this PR there is now a new “BaseTarget” build target that features the relocatable build target settings. At some point I will either edit the revised steps into this tutorial or create a new tutorial. To help me decide I’m going to leave a poll here with the hopes that I’ll get a few replies to help me decide. After all, I am doing this all for the benefit of others, so it makes sense to ask others which approach will work best.